*Conditions for Guaranteed Trade Value (GTV) Offer. Trade in value is the ride away price of the Ninja 400 $7,078 – Ninja 400 KRT & SE $7,285, less dealer delivery fees and government on road costs. Therefore $5,800.00 STD or $6,000 KRT & SE respectively, is the Guaranteed Trade-in Value (GTV) and this will be the trade in value subject to the following conditions… Offer available when you purchase a new MY19 Kawasaki Ninja 400 this monthly only or whilst current stock lasts from TeamMoto. The Guaranteed Trade Value (GTV) is defined as the cost of the motorcycle as stipulated on the purchase contract (Price Including GST), less dealer delivery fees and government on road costs. This does not include parts, accessories, fitting labour and apparel purchased with the motorcycle. The full guaranteed future value will be offered if the motorcycle is traded any time up to twenty four months, and meets the stipulations outlined in these terms and conditions, less delivery fees and government on road costs. And has been serviced as per the manufacturer service schedule at the dealership it was purchased from and is in full operating roadworthy condition without cosmetic damage (excluding normal wear and tear). If the motorcycle does not meet these requirements it will not be eligible for the Guaranteed Trade Value offer. 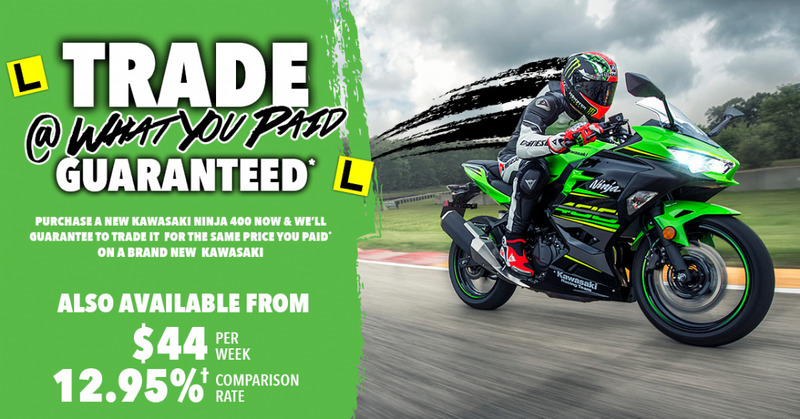 The Ninja 400 can be traded up to any Kawasaki full-power non-lams model at the Manufacturers Recommended Ride Away Price. The Kawasaki Ninja 400 motorcycle must be purchased and delivered by the end of the promotional period or whilst current stock lasts from TeamMoto. The Guaranteed Trade Value must be claimed within 24 months of the purchase date, as stipulated on the Guaranteed Trade Value Claim Card that will be received at the time of purchase. Not valid with any other Offer. Offer available to purchasers using either cash or finance. †The payment $44 per week is an indication only and is based on an RRP of $7,278 with a net loan amount of $8,485 for a term of 60 months at an annual percentage rate of 12.04%. The comparison rate is 12.95% and is based on a secured loan of $30,000 for a term of 5 years at the annual percentage rate of 12.04%. The amount of credit provided to you and the term of the loan may be different to this. 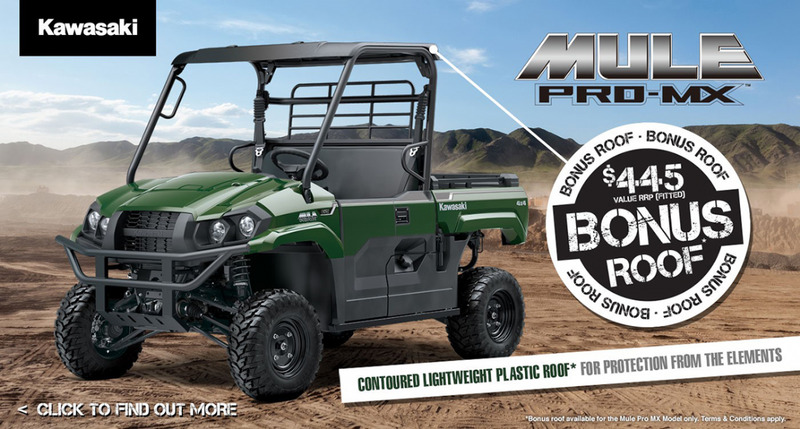 Bonus Roof is available for the 2019 MULE PRO-MX only. $445.00 RRP Value (fitted). MULE PRO-MX is to be purchased, and collected from the dealership, prior to the end on the promotion period. The completed enquiry form will be emailed to the nearest participating dealership (based on the supplied postcode). 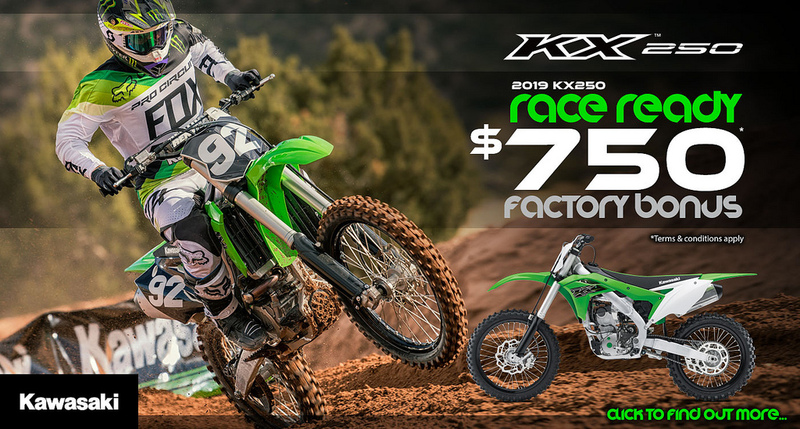 The promotion is available at participating Kawasaki dealerships from 1/2/19 until 30/6/19. 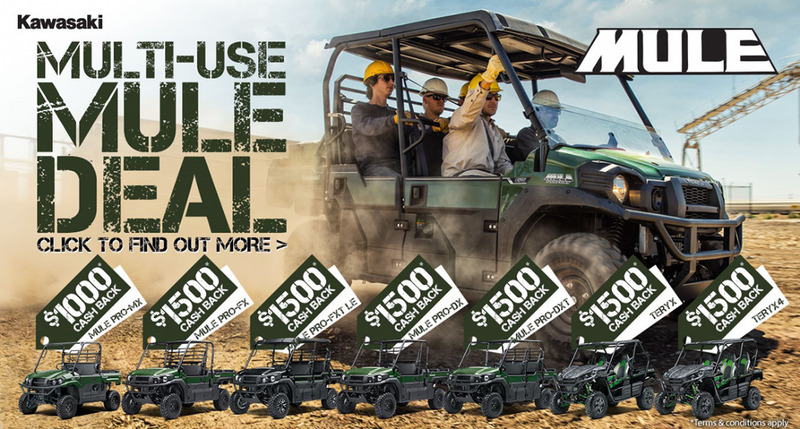 $1000 Cash Back on the MULE PRO-MX, $1500 Cash Back in the MULE PRO-DX, MULE PRO-DXT, MULE PRO-FX, MULE PRO-FXT LE, TERYX and TERYX4. Applicable MULE model must be purchased, and collected from the dealership, prior to the end on the promotion period. The completed enquiry form will be emailed to the nearest participating dealership (based on the supplied postcode). 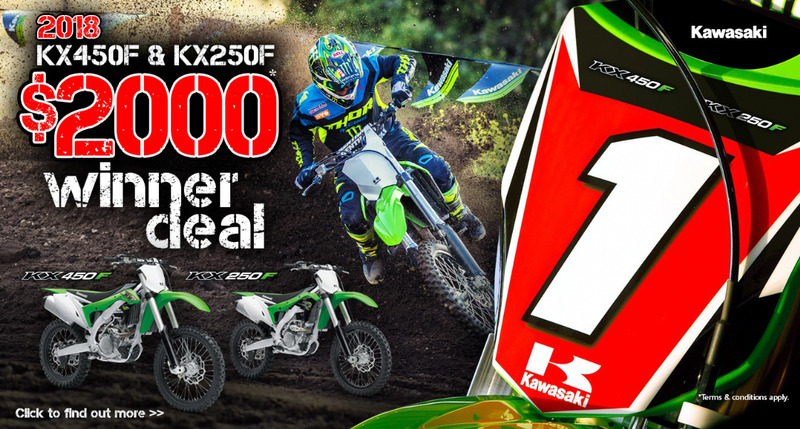 The promotion is available at participating Kawasaki dealerships from 1/4/19 until 30/6/19.